All dogs sit, and let’s face it, they never pay attention to the fact they are sitting. It may be in response to a command, fatigue, the hope of a treat, or just because they are tired of standing. There are many things that go into the mechanisms of a sit. Proper range of motion of the hips, knees, hock, pelvis and spine are needed. In addition, proper core strength, hindend awareness and control are necessary. In the human world of fitness, everywhere you look the beneﬁts of achieving and maintaining a neutral spinal alignment are being discussed. Let’s start with the basics. Proper range of motion or flexibility is necessary. If your dog does not have the proper amount of hip, knee and hock flexion or bend, they will not be able to sit properly. If that flexion is not present, it is important to determine why. If your dog does not have proper pelvic symmetry, their sit may also be off. Again, it is important to determine why that have an asymmetry. I am currently working with a four-year-old Corgi that was hit by a car when she was eight months old and has a healed pelvic fracture. She will never have a tight sit due to the pelvic issue, but we can work with what she is able to do. If your dog has proper range of motion and proper symmetry of the pelvis, the next thing to look at is strength. And the first step in strength is understanding what a neutral spine is. Working with a neutral spine allows the natural curves of the dog’s back to help protect the spine. It also places the least amount of stress on the soft tissues and bones while allowing optimal breathing and circulation of blood and oxygen. In addition, it also facilitates optimal balance for the dog with the least amount of energy. 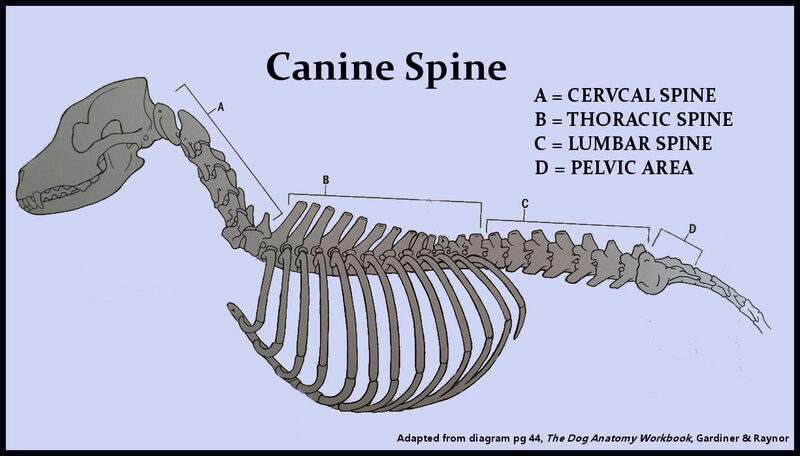 The dog’s spine is comprised of four areas: the neck or cervical spine, the mid back or thoracic spine, the low back or the lower spine, and the sacrum and pelvic area. The cervical spine should be in a lordotic posture, or curve inward similar to a semi-circle. The mid back or thoracic spine has a slightly outward or kyphotic curve. The lower back or the lumbar spine curves slightly inward or in a lordotic curve. The pelvis or sacrum is in more of a straight posture. The natural curves of the spine are controlled by the muscles, the boney aspects of the spine, ligaments and tendons. These structures protect the spinal cord. The body does an excellent job of setting up the protectors it needs to help assist the spinal cord. When looking at a sit, the first component we need to look at with a dog is the pelvic tilt or a neutral lower back. In my previous blog, we talked about a not so pretty sit pretty. Very often, persons will teach their dog how to sit pretty without teaching them a proper sit. To begin a proper sit, we need to help engage the dog in a pelvic tilt. Some dogs do it naturally while others need a little bit more of assistance. The first step will be to begin on a flat surface, such as the floor or a flat table. The proper form when a dog sits is for the pelvis to tilt slightly under. There is a forward movement, and this is assisted by lumbar and pelvic flexors, some contribution from the hip flexors, and stabilization from the lumbar extensors. When the dog stands, the lumbar and pelvic extensors are more active and move the pelvis in a backward motion. Sometimes, the gluteals are active as well. When the dog sits, the lumbar spine moves into a slight flexed posture. And when the dog stands, the lumbar spine moves into a slight extended posture. :02 – as the dog is encouraged to sit, place your palm on the lower back or lumbar area. This will help facilitate a cranial pelvic tilt, or a tilt towards the head. :08 – a little bit of pressure may be given at this point to assist with the pelvic tilt. No force should be exerted. :14 – encouraging the dog to sit and then stand slightly with the light pressure will further assist with the pelvic tilt. :18 – this in itself is an exercise to assist with the contractions. Sometimes, dogs cannot perform this movement. It may be due to postural weakness, tightness in the hip flexors (i.e. iliopsoas problems), tightness in the abdominals or the lower back, pelvic asymmetries, hip disease, stifle disease, and previous histories of trauma. Very often, growing puppies have a tough time with a proper sit. Part of this is due to the rapid growth of their hindlimbs, and their lack of body awareness. They will hopefully outgrow it. The core muscles are so important for a proper sit. 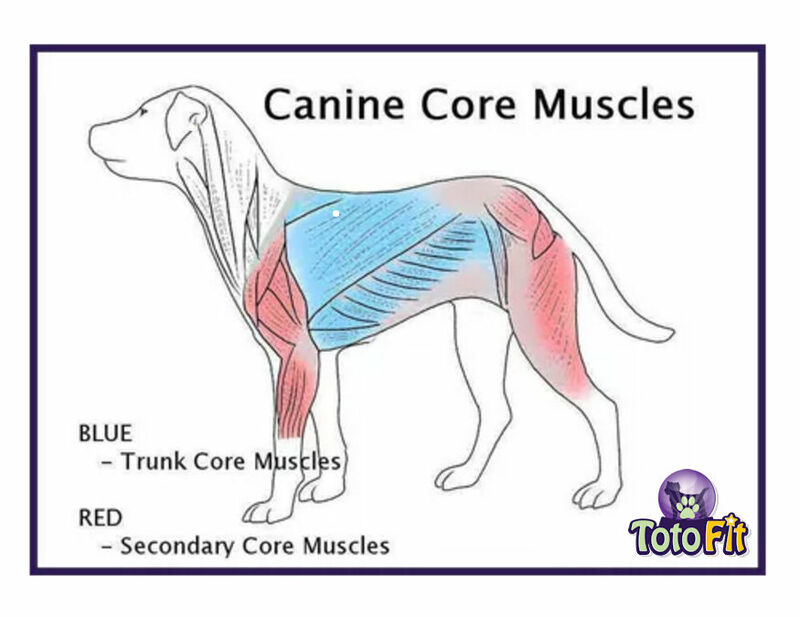 As we have discussed, the core muscles are the large muscles of the trunk inclusive of the muscles of the back and spine, and the abdominals. These postural muscles are very active during most functional activities – sitting, eating meals, walking, standing, and breathing. This video shows the second level of difficulty and involves the K-9 Kore Disk. As the dog sits, again, you can place your hand on top of its lumbar area to remind it to tuck its pelvis under. Just a small amount of pressure will assist with proper sitting. The instability of the disk increases the difficulty. This should first be performed on the floor before moving to the unstable surface of the disk. How do I work on pelvic stability? The videos above are the perfect start. Teaching the dog a pelvic tilt will be the first step in organizing the sit. Asking the dog to perform the sit on a narrow elevated surface like an aerobic step bench will help it to pull its legs underneath. What if my dog has short legs? Short-legged dogs need to sit with a purpose, too! I often find working at their level on sit to stands is the first step. Place them on a grooming or pause table to help you help them. They may need a surface like a phthalate free yoga mat with good grip to start on. What if my dog sits to the side? The first step will be to determine if there is a structural problem causing the side sit. Sometimes it is something inherent that needs to be worked with. If the dog is free from any structural or orthopedic problems, work with your hands to assist the dog in sitting properly. Sitting on an unstable surface like the K-9 Kore Disk or Wedge and doing gentle side-to-side weight shifting will facilitate a proper contraction and assist the dog in achieving symmetry. « Sit Pretty — What if it’s not Pretty? ?